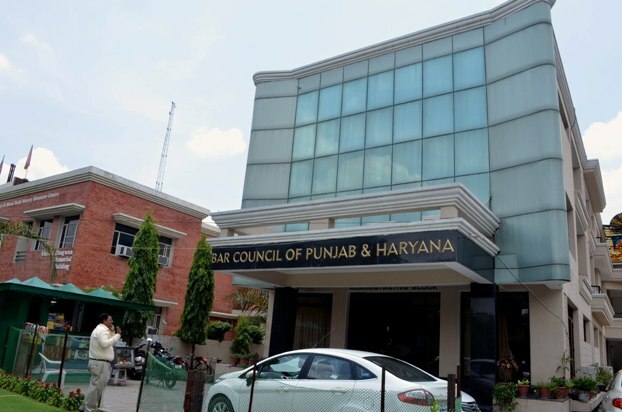 The Elections for the Bar Council Punjab & Haryana finally took place on 31st May, 2013 in Chandigarh and on 1st of June in Punjab and Haryana. These elections which were earlier scheduled to be held in December 2012, found their way in mid of 2013. The weather was already hot and these elections added to the heat through out Punjab, Haryana and the City Beautiful Chandigarh. 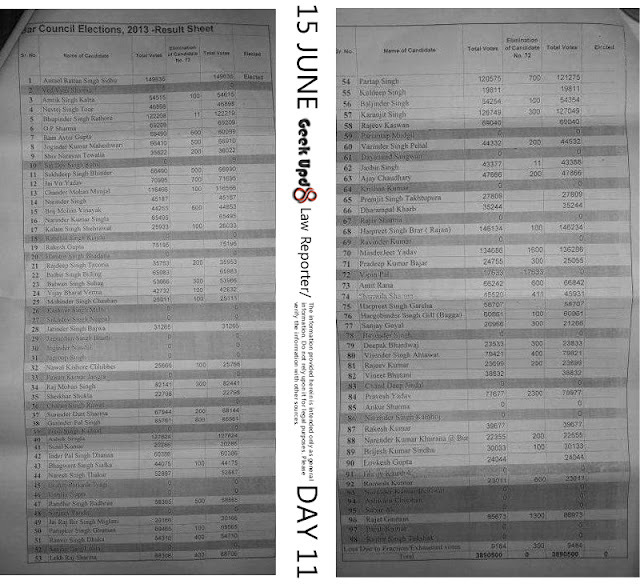 The counting was scheduled to start from 5th June, 2013 and it started on time. And today the results of the Day 1 are out. The candidates have made their best efforts, without worrying about the firy hot weather outside their offices and have mad their best efforts to get in touch with all the advocates. This enthusiasm have brought fruits to many and some had to face hard time with the outcome of election results. Conclusion : The top 5 emerging winners from the day one counting are namely : Anmol Ratan Sidhu, Harpreet Singh Brar (Rajan), Chander Mohan Munjel, Lekh Raj Sharma and Partap Singh. The day 2 reports image not that much clear, but the Day 3 reports clearly depict the current scenario. The top 5 names that were leading on first day of counting are still in front row. 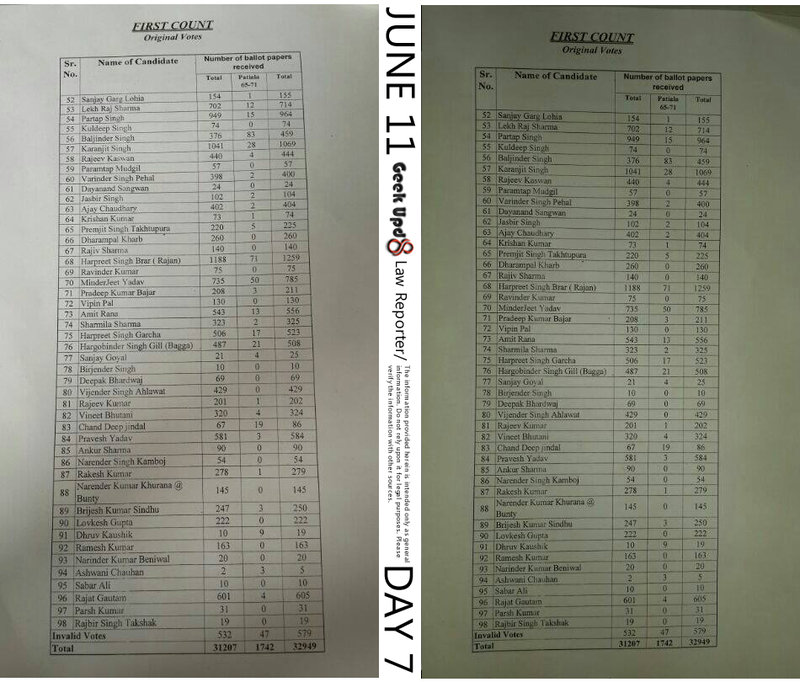 Here's the day 3 report. 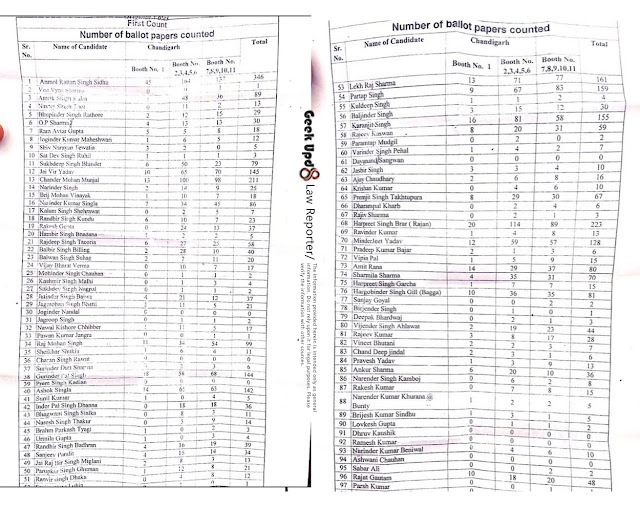 The candidates who have secured more than 350 votes have been highlighted for your convenience. The competition is getting harder and tougher day by day. Wish your candidates Good luck in the comments below, as perhaps this is what they need. Well to start with today's review, we have highlighted the candidates that have gained more than 400 votes. Thus they have out rightly left others behind. 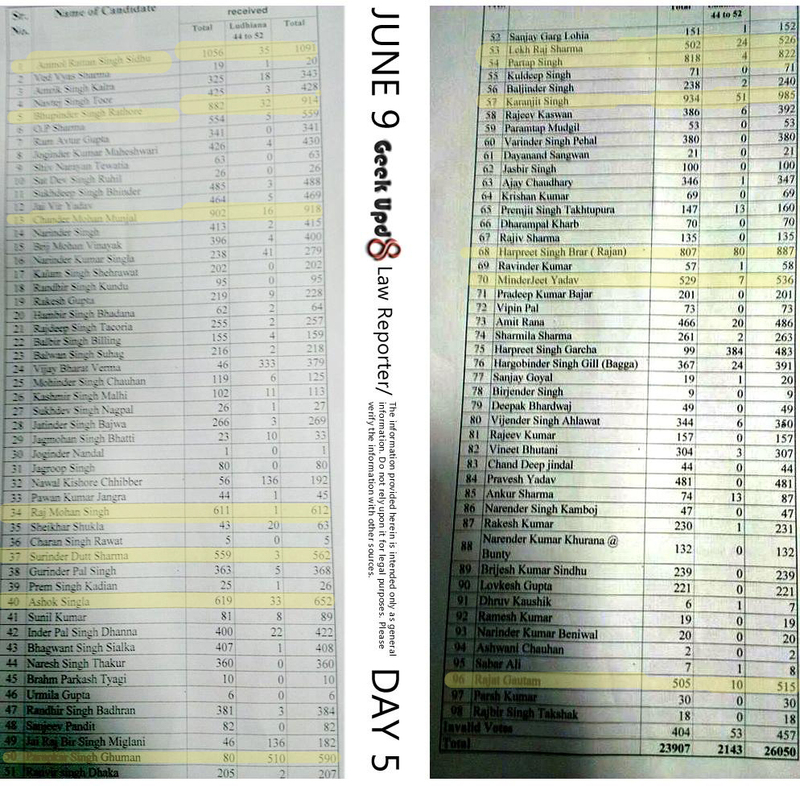 But what we can notice in the results on day 4 is that many of the popular names are not highlighted, it wont be good to point out the names, so we leave it your wisdom. 1. Anmol Ratan Sidhu, 2. Navtej Singh Noor, 3. 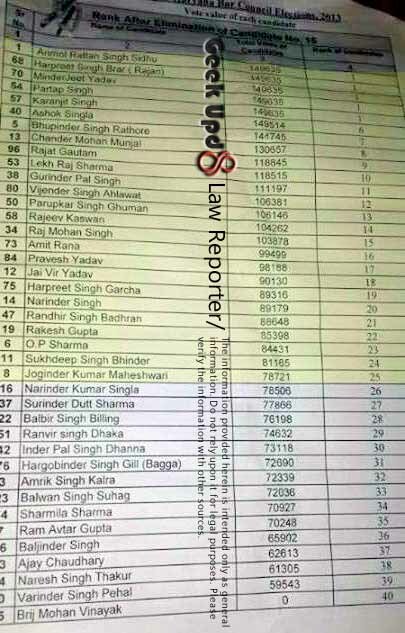 O.P Sharma, 4 Joginder Kumar Maheshwari, 5. Sukhdeep Singh Bhinder, 6. Jai Vir Yadav, 7. Chander Mohan Munjal, 8. Narinder Singh, 9. Raj Mohan Singh, 10. Surinder Dutt Sharma, 11. Ashok Singla, 12 .Lekh Raj Sharma, 13. Karanjit Singh, 14. 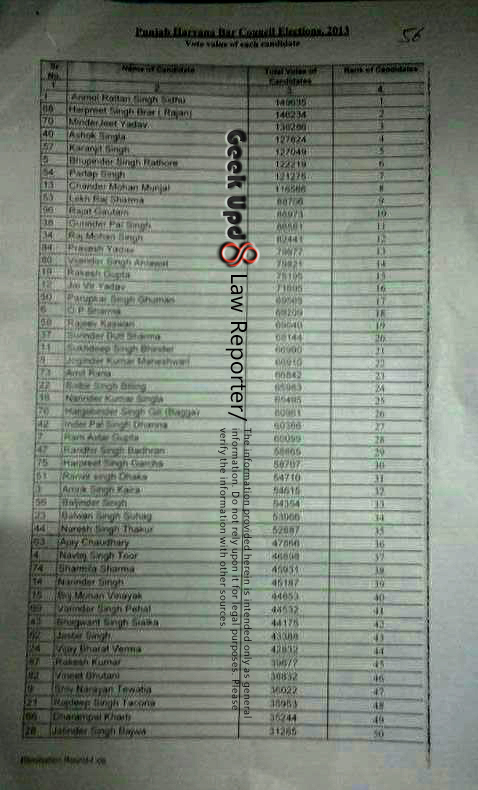 Harpreet Singh Brar, Amit Rana and 15. Pravesh Yadav. So, 15 candidates are strongly approaching the victory line, or we can say they have reached that stage where they are safe now. Still counting have reached booth number 41 (Jalandher) at the end of Day 4, and there are lot more ballot boxes to open yet, which will unveil the destiny of candidates. Good luck who appeared in the safe zone. Another day has passed, and we are again here waiting for the results, well me (Puneet Batish, Adv) too curious about what comes out and the calls that keep coming to me , make me more excited and to approach my contacts to get the latest details about the elections. So, at the end of day 5, we have some nice trends that have cleared the scenario. 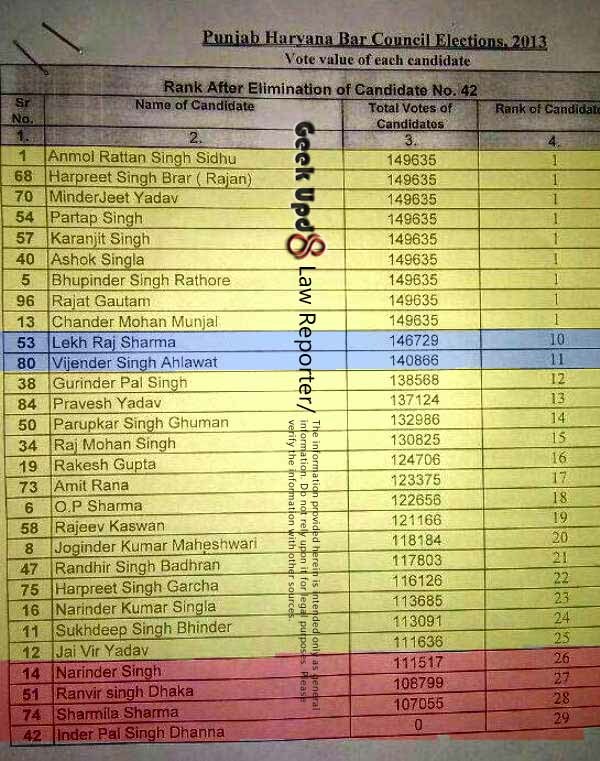 We have highlighted the candidates that have passed the 500 mark in our result details, so that you can have a clear idea about the leading candidates. Now the stats say that the last polling booth that was counted today was 52, and tommorow the counting would start from Mansa District polls (booth number 53). 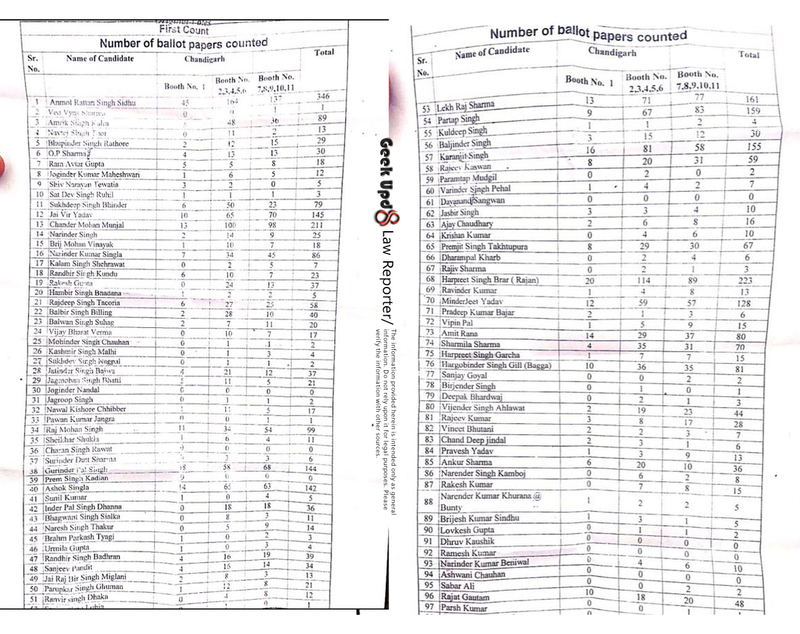 So far 457 votes have gone wasted from a total of 26,050 votes as they have been casted wrongly, out of which 53 were from booth number 44 to 52 where 2143 votes were polled. So, wait for tomorrow and we'll be here with the latest trends in the bar elections. Good luck to all Candidates, keep your fingers cross and keep praying to almighty to help you reach your goals. June 11th, the 7th day of counting brought ups and downs in the ranking of lots of candidates, however the candidates that have reached the safe zone, appeared to be quite constant in their up going graph. 8th and the final day of counting of the first preference votes. 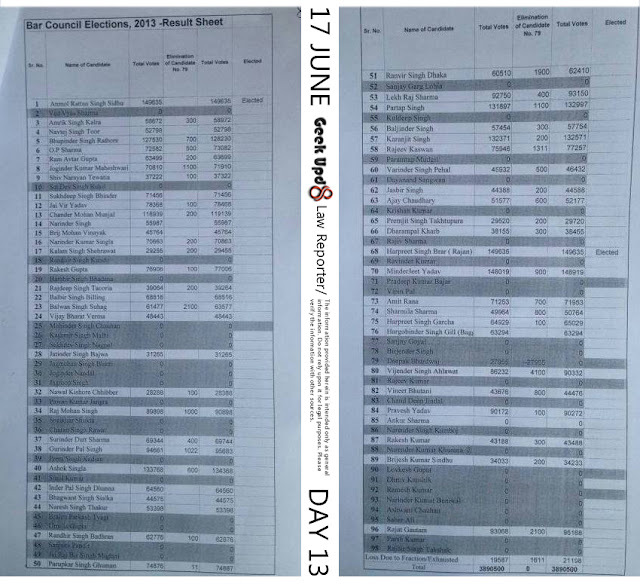 June 12 was the say when, the final list was prepared, which had the details of total number of first preference votes that the candidates have got. 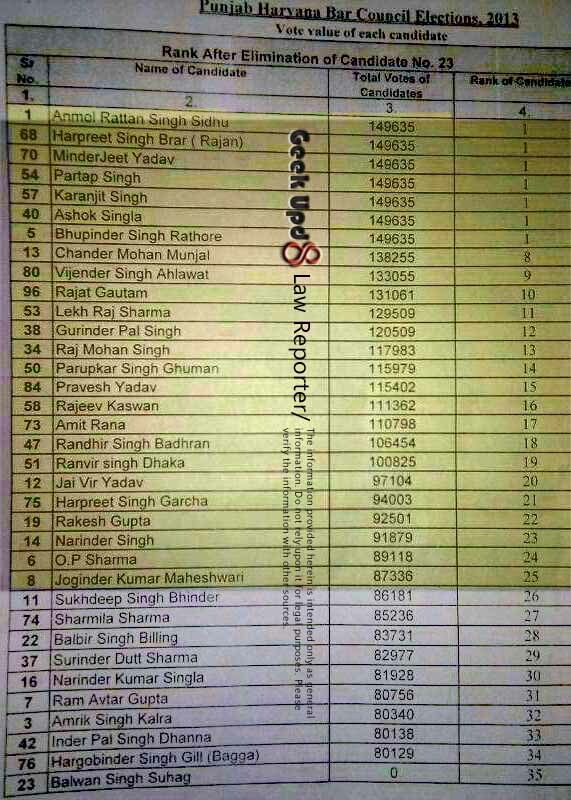 This was the final list and most probably as everyone predicts the top 25 candidates are believed to be the most promising candidates for the Members of Bar Council. Updated : Here's the official rank wise list of all the candidates, calculated on the basis of the number of first preference votes obtained. Today it has been said that paper work will be completed and only after that the next round of counting the second preference votes will start. Though, practically top 25 candidates have a tight grip on the Bar council Members posts, but still vote for all the candidates will be counted, that would obviously take time. 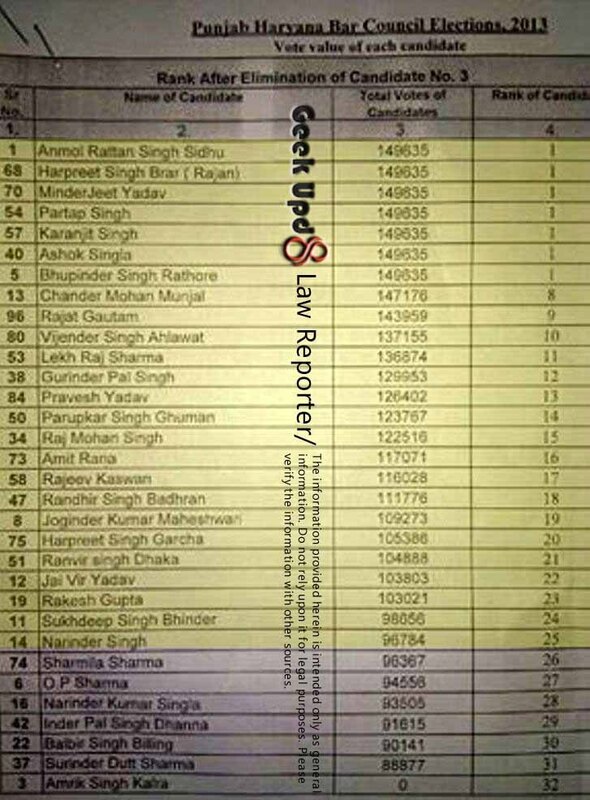 The second round counting started and by the end of the day 17 candidates were eliminated, whereas Anmol Ratan Sidhu had created a history by getting elected in the first round itself securing more than required votes for being a member. 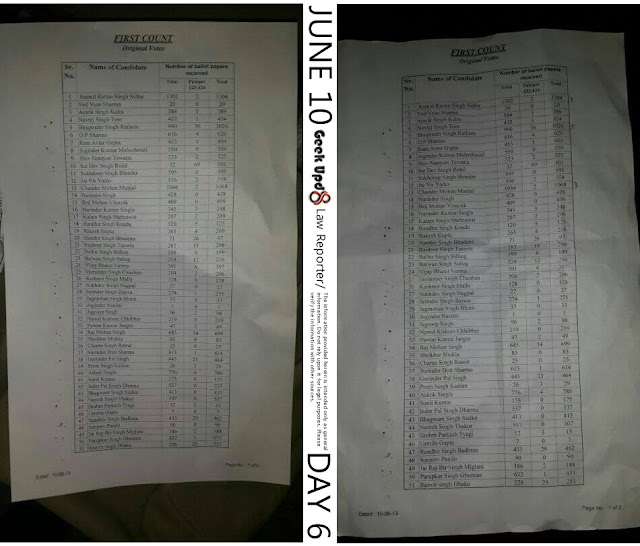 The list of the candidates which were eliminated was prepared and is underneath. Keep your fingers cross and pray your candidate not in the list. Another day has passed and we are here again with results. There was some technical issue earlier that now has been fixed and we are running smoothly as ever. On first day of counting of 2nd preference votes that is 14 June, 17 candidates were eliminated, and today that count has reached to 32, resulting into the up and down in the ranking of various candidates, which you can see specifically for your candidate in the list below. The candidates that have been eliminated today are highlighted for your convenience. 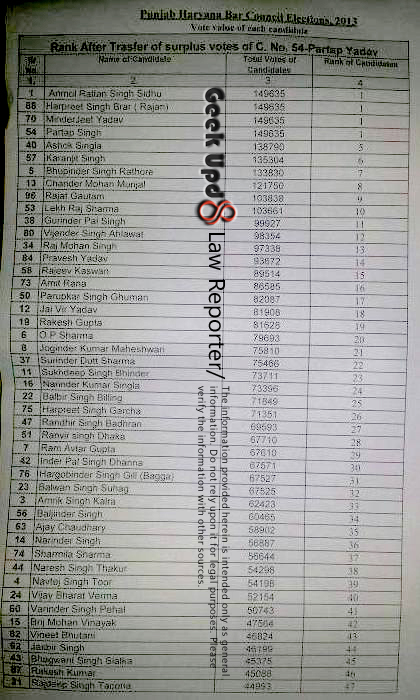 This list have candidates arranged in order of ranking they have gained by number of votes they obtained. As the candidates are getting eliminated, ranking order is likely to change, but most probably, the top 25 would be the same, as a matter of fact, you might see change within those top 25 candidates. Rest of details in list. Daya Sharma, a journalist from Chandigarh in Dainik Jagran stated : बार कांउसिल आफ पंजाब एवं हरियाणा की मतगणना लगभग पांच घंटे तक रूकी मतपेटी से छेडछाड का शक, चंडीगढ पुलिस ने सीसीटीवी जांच कर छेडछाड के आरोपो को नकारा मतगणना शुरू. The ballot box were reported to be broken and the Chandigarh police is watching the CCTV footage. And the counting has been stopped. UPDATE: Sources have confirmed that the matter has been sorted out, and the counting is supposed to resume in next few hours. The counting was resumed at around 2 PM. After all the mess, 17th June brought many changes for candidates. As the matter was reported, nothing came unusual came out and normal counting process started. 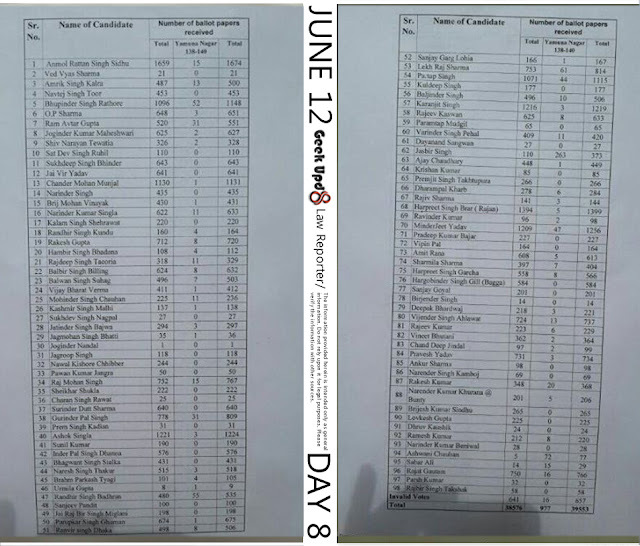 The total number of eliminated candidates reached to 44 and remaining 54 candidates are in fray. 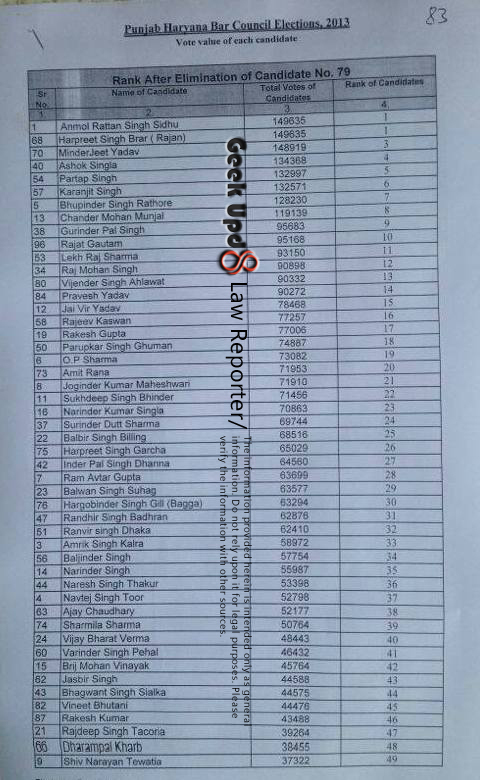 So far two candidates namely Anmol Ratan Sidhu and Harpreet Singh Brar, have cleared the quota of being a member of bar council, that is 1497 votes. Rest you can have a look at the list below. Now following is the list of candidates in the order of ranking on the basis of number of votes they obtained in the bar council elections 2013. See if your candidate appears in the top 25 ones. Good luck from our side. Few changes on the end of 18th June in the ranking order of candidates, mostly in the top 25 ones. The counting might take few days more to declare the winners. Minderjeet Yadav has been declared a member of bar council, as he cleared the quota today. 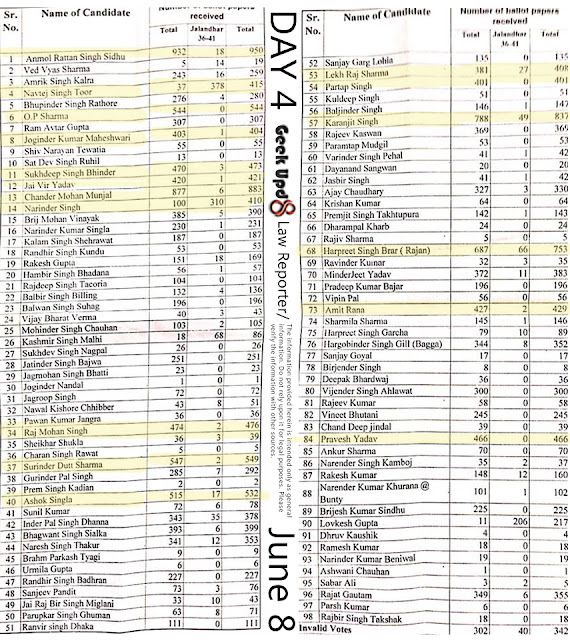 Here's the list of all 47 candidates that are left, in the order of their ranking as well as the number of votes they have obtained. A big day for Karanjit Singh ( Candidate number 57). It was really a big dramatic change that brought him as number 1 contender in Punjab & Haryana Bar council member elections 2013. It was really surprising as Karanjit Singh was at number 6 earlier, as you can track down the changes by comparing with previous days results. Yesterday Karanjit Singh votes were 135304, and today the number is 150304, whereas the number of votes for Anmol Ratan Sidhu remained the same as yesterday, which is 149635 (as visible in available images). Rest of the candidates were having routine gradual increase. Following list shows the candidates in order of their ranking, on the basis votes obtained. 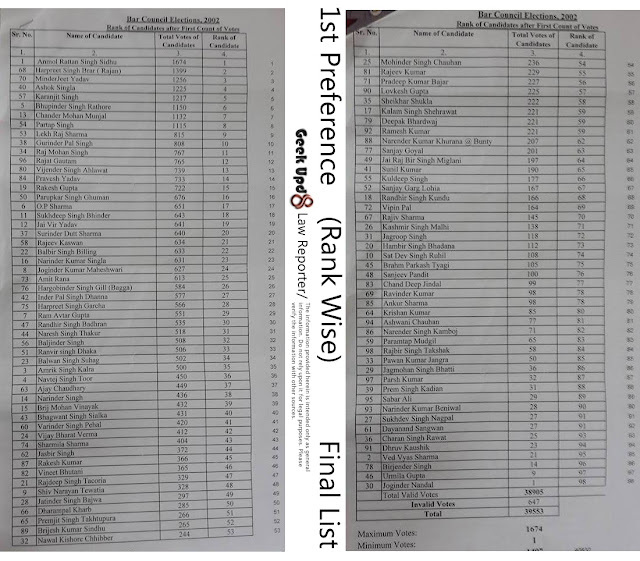 The top 25 candidates have been highlighted for differentiating them from others. Have a look at it and enjoy. Good luck for tomorrow. The day was ordinary, with gradual increase in the vote count of all candidates. 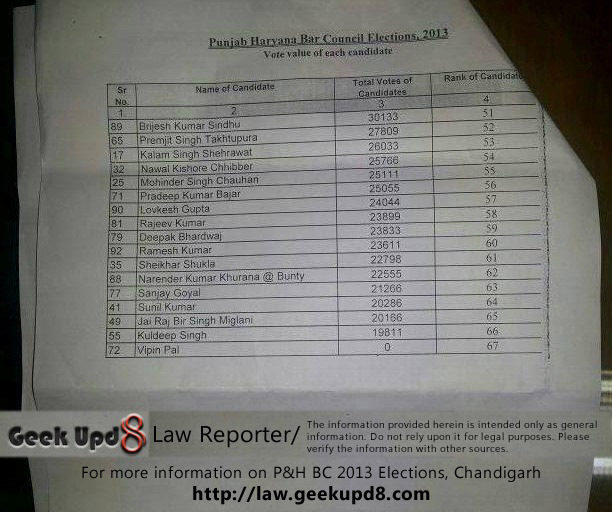 The list below provides the latest ranking order of candidates in the Bar Council of Punjab & Haryana Elections 2013. 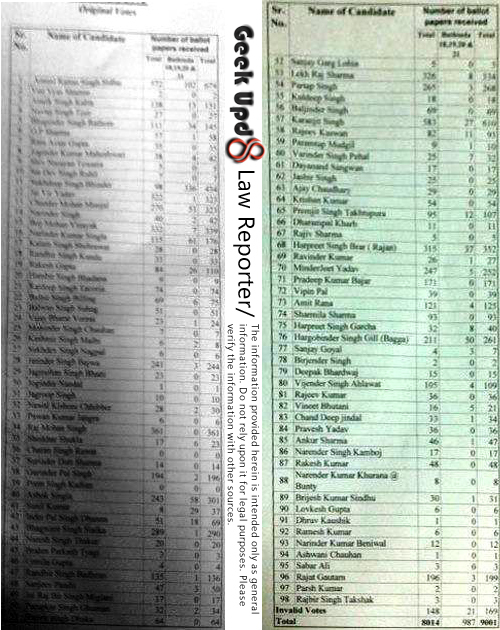 Another day passed and we are left with 35 candidates, that is just 10 more candidates are left to be eliminated and we'll get our New Bar Council Members of Punjab and Haryana for year 2013. Most probably, these remaining 10 would be eliminated by tomorrow, but still that cant be said for sure as it totally depends on the number of votes left that are still to be counted. But anyways the list is pretty clear now and we can see our prospective bar council members highlighted in the list. Following is the list in the ranking order for today till the counting stopped. 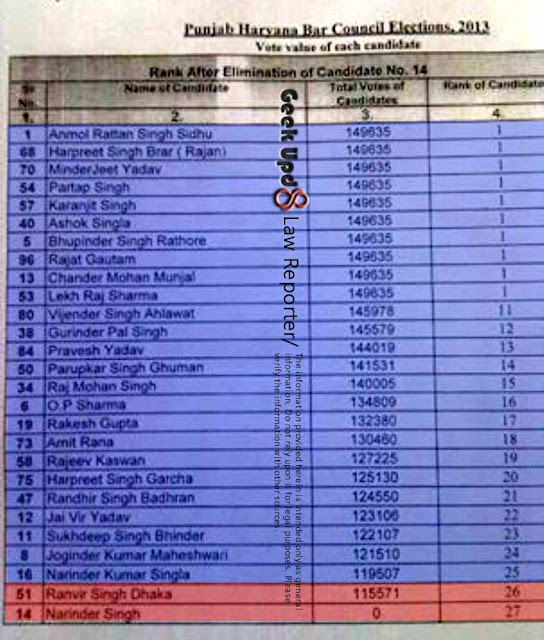 So, it's the time to congratulate your candidates if they appear in the list in highlighted part. Big day for Rajat Gautum and Chander mohan Munjal, they made into the elected Bar Council Members List today. And some big names, as we were expecting were eliminated from the list today, which no one was expecting, as said by their supporters. Balbir Singh Billing and Inderpal Singh Dhanna both were eliminated. Following is the list of candidates, for today in the ranking order. We made some demarcations for you. 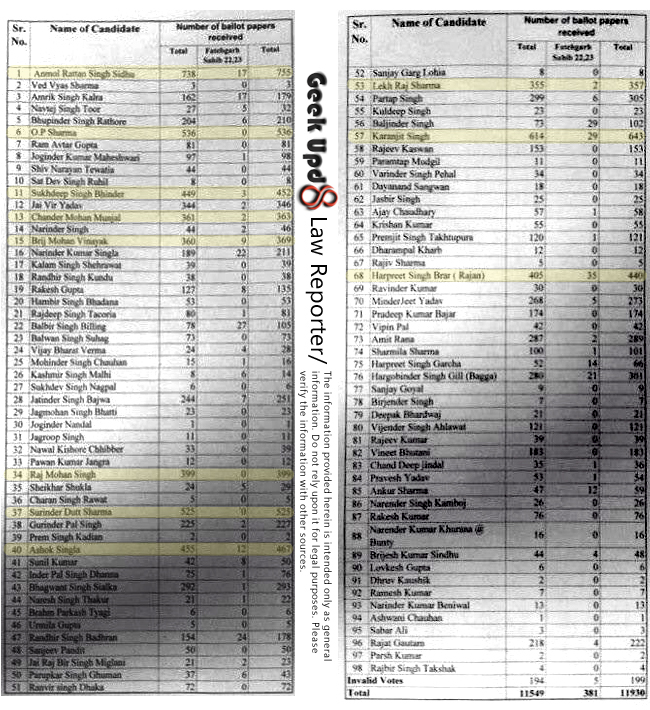 YELLOW color indicates the top 25 candidates. 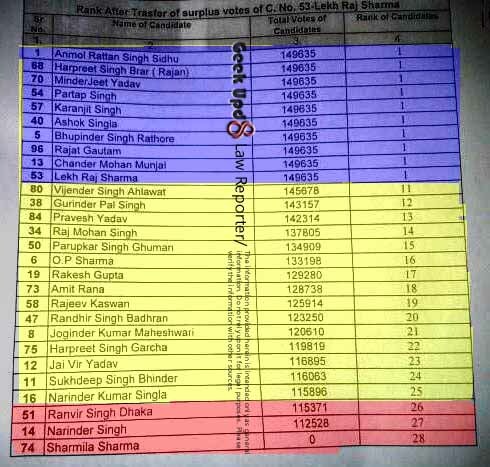 BLUE color is for candidates which are most close to the QUOTA (1497 Votes). RED color is for danger zone, candidates that are most likely to be eliminated next. The is the latest list, with Yellow portion depicting top 25 candidates, Blue color is for already selected candidates, whereas Red is for those who are in danger zone. The counting is finally over, and we are providing you the final list of our Elected Bar Council Members for the year 2013. Tenure as you all know is 5 years. The selection of Chairman and other posts is yet to take place. We hope you really enjoyed this journey with Geek Upd8. We are never dormant. Along with posting these Bar Council Election Updates, we keep on writing about our Laws News, latest Citations and much more. Please do come back and stay in touch. And now the final list, the Blue color shows the selected candidates. The 26th candidate is not eliminated by way of counting, it is considered as eliminated of it's own. So congratulations to all selected candidates and their supporters. Good luck to all candidates, thanks for the updates. good luck brar sahb (rajan). you will win , we are with you. good luck lekh raj sharma ji. thanks for results. Thanks for updating Bar council Results. 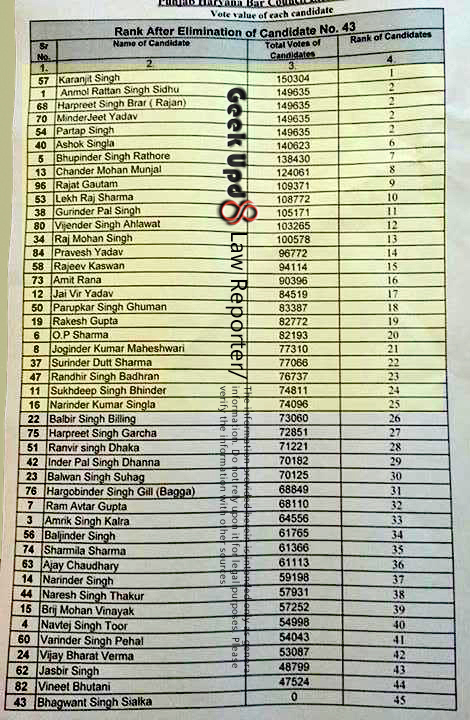 I am not satisfied this pattern of the election.The constituency is whole punjab Haryana and chandigarh i.e. more than a M.P.Thereafter the voting preference system is not understood as to why it is so complicated .It is not understood as why it has been made simple dividing the whole bar council area in the constituency geograhically depending on the Nos of the votes on any appointed day .Complicacy of the election should also conmensurate the post.Even it is more complicated then the election of the President of India .The Bar Council should have at least done some thing in this direction at least for the convenience of the Candidates ,their expenses , for the conveniences of the acquaintance of the candidates to the voters.I do not know any thing about a candidate belonging to Ferozepur Pb being belonging to Haryana.Rs 5 lakhs have been paid to Returning Officer for conducting our elections. Elections results of 09 June 2013 are still not on net and it should be quite hightech we are calling our candidates and counting agents for scores of votes.After elections also the plight of the Advocates is not going to change as it has not changed since the beginning an average advocate can not make his point effectively as there is no effective complaint hearing system against the judges till now and every thing is purely discretionary. Well in case you want to raise your voice using Geek Upd8 as your platform, i suggest not to stay anonymous, so that whatever you saying could be considered to be authenticated as your version. candidates spent huge money from their own pocket but for what ? I will appreciate if anybody can explain. We as advocates pay the fees for enrollment and other charges from time to time if that money attracts them ? I do not understand ? In my comments I have said that if the election is made geographically delimited likewise lately for MPs consituencies ,there was a delimitation commission headed by Justice Kuldeep Singh retd SC Judge, in that event it will be convenient for the candidates also as well they will be well acquainted to the voters also and that will be resulting in the saving of their expenses of pamphlets ,banners,and conveyance expenses and I think it will be beneficial for all voters as well as to the candidates as they will not need to go to the voters who do not know them even remotely by visiting them from East to West and north to south except within their constituency.The highest body of the nation i.e. Parliament election also have the geographical limitation who are the highest law makers of the country then why it should not be made for us.Their counting is done maximum within a day and sometimes by electronic voting machines within hours even having more than ours votes.I think suggestion is good for all but also I think will not be considered as it has not been looked into till now .The other aspect of flourishing practice will not be affected thereby nor I allege any thing about that because sometime 10 lakhs can be earned only in one and single case also that is purely individual aspect .Ours nearabout 30 thousand votes have not been counted till now and it will take some more time.My suggestion is for making the whole process simpler for all voters as well as candidates. Please update the result of Bar Council elections on the daily basis. In india there is no value of truth remains if value remains than the truth remains as stale or old (BUDHI) .There is the reason that the President of USA is the most powerful man of the world .They can catch and arrest and kill Saddam Hussain and also most declared dreaded also Osama Bin Laden ,whereas they can not do any thing of Dawood.Because here is the pursuit for the money and there is the pursuit for the nation. i have the final result of first count! !how can i upload it??? Could u please send me the final result of 1st count at my mailID..? what would be the next step after 1st counting has been completed. Is it final result or something more gonna happen for final result. Dear Friend what after 9 th. Would be appreciated if latest position is updated by any concerned person. There has been some technical reasons behind the delay. Hopefully you'll get the updates smoothly now onwards. Thanks for understanding. Congratulation to all the leading and winning members ! May God bless them all with the wisdom to protect 'Our Country' from the onslaught being committed by our own fellow country men in the garb of so called leaders and with a force to inspire the people at large to stand against injustice and to save the pious profession of advocacy. thank you so much. 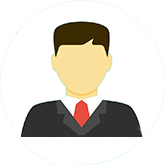 your website have given advocates a platform to share views and easy way to access all information that a lawyer needs, along with most current topics like bar elections. all the best & Congrates to Bhupinder singh rathore ji. Dr. Anmol Ratan Sidhu is matchless, and so invincible too. Congratulations Sharmila ji on achieving good position. Congratulations to the winners and tough luck to the remaining. You are really a good decision maker .your opinion about this race of president is totally right .